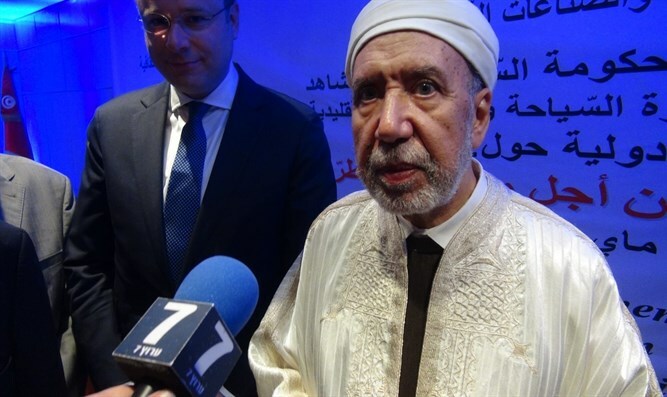 Arutz Sheva spoke with the Grand Mufti of Tunisia, Othman Battikh during the recent visit of a delegation of the Conference of European Rabbis to Tunisia last weekend. The rabbis were invited by the Tunisian government to strengthen the Jewish community, the Rabbi of Tunisia Rabbi Haim Bitan, and cooperation between Jews and Muslims in the war against Islamic terror. The mufti welcomed the delegation, calling for unity between different faiths. “Welcome dear visitors, our brothers from the Jewish community and their head rabbi, and everyone who is with him. “Welcome to our beloved country, the land of peace, the land of coexistence of all religions, it doesn’t matter if you are from the three religions which worship God (Christianity, Jewish, Islam) or any other one, what unites is that we are humans.